Chatswood Private Hospital, on the corner of Albert and Archer streets, will be Sydney’s only dedicated private hospital for such surgical procedures. Managing director of hospital operator PresMed Australia Mark Resnik said a team of 35 ophthalmologists and 20 ENT surgeons and specialists would help ensure the hospital ­became known as a “destination for medical excellence”. “Our medical specialists have been operating in separate facilities in Chatswood for the past 20 years but they will now perform the most advanced procedures in our state-of-the-art hospital,” he said. PresMed Australia chief operating officer Roger Cronin said the hospital had undergone a $10 million fitout which featured the latest technology designed to treat adults and children. “One example of new technology being introduced to the hospital is femtocataract laser-assisted cataract surgery,” he said. Willoughby Mayor Gail Giles-Gidney said the hospital would attract visitors to the area. Australian Medical Association NSW president clinical associate professor Saxon Smith said private hospital services were an essential part of the Australian healthcare system because they reduced the demand on public hospitals. 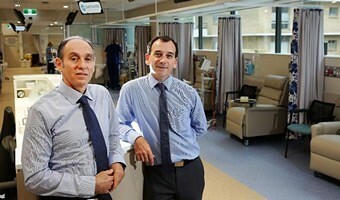 “The AMA welcomes new private hospital services in any speciality,” he said.